If you’ve ever forgotten about a cheese wedge in the fridge, you may have discovered something mysterious growing on it, a sure sign that it’s no longer edible. But have you ever wondered where the microbes responsible for that change came from? That’s one of several questions that the latest group of high school students in Rockefeller University’s Learning At the Bench After School Program set out to answer, gaining valuable active learning and deductive reasoning skills along the way. This year’s cohort focused on exploring the vast assortment of microbes—called the microbiome—in our food. First, they learned the basics: Microbes are microscopic organisms that are all around us—beneficial in some ways (fermentation of food), harmful in others (infectious disease). Then, the students designed their own research projects. For example, some students compared microbes in organic and non-organic food, while others chose to analyze the microbes in frozen yogurt. The program also partnered with New York–based cheese shop Murray’s Cheese. Microbes play a vital role in cheese-making; without them, we wouldn’t have the hundreds of cheese variations we know today. 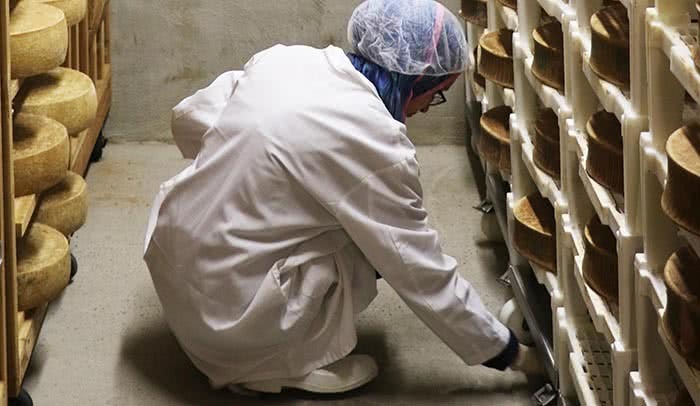 The milk product inside cheese is broken down by microbes in a process called fermentation, and altering the microbes can change how the cheese matures and tastes. The students had the opportunity to visit Murray’s cheese caves—chambers built to control the temperature, humidity, and microbial activity of the atmosphere so that each wheel of cheese can be ripened to perfection. During the visit, the students swabbed different regions of the caves, then brought the samples back to the lab to assess the microbial environment that the cheeses fermented in. They learned hands-on research techniques such as culturing the microbes to grow on plates and extracting DNA, and in the process, experienced the scientific method firsthand. The Learning At the Bench After School Program was created in response to the diversity and inclusion issues seen in science. The lack of diversity, particularly at higher levels in science, can be attributed to a number of complex issues, but a major contributing factor is often that access to scientific training opportunities is not equally available to all. Jeanne Garbarino, director of science outreach at Rockefeller, wanted to tackle this problem head-on. She created this program to promote, teach, and encourage highly passionate students, with an aim to improve their chances in future scientific and academic endeavors. Recruitment of students is focused on underserved areas with few resources, and students that successfully complete the program are eligible to participate in an intensive summer program called the Summer Science Research Program, where they are paired directly with a Rockefeller scientist and complete research in one of Rockefeller’s laboratories. Another benefit of the program is that it provides a quantifiable teaching and mentoring experience to graduate students and postdoctoral fellows at Rockefeller, which is particularly valuable given the changing career landscape for Ph.D.s and the need to acquire transferable skills off the bench. This year, the program was co-facilitated by graduate students Lizzy Hubin and Devon Collins. Visit Rockefeller’s Science Outreach program online for more information.